Who it’s for: All snorers, but will be most effective for tongue based snorers. Product manufactured by: Mpowrx Health and Wellness Products, Inc. This Good Morning Snore Solution Review will attempt to answer the question; is this mouthpiece the right one for you? If you are considering whether to buy the Good Morning Snore Solution mouthpiece or not; then read on. I know how difficult it can be to choose the correct stop snoring device, with so many purchase options available on the market these days, how do you choose? This review will show you everything you need to know about the device, how it works, its pro and cons, and many other important matters. First a refresher; what is snoring and sleep apnea? Most people sleep with their mouths open which then allows the jaw and tongue to fall back into the back of the throat. This then causes the airway to narrow. Snoring is when air is restricted through the nose and mouth because of the narrowing of airways. The more constricted or narrow the airway, the greater the vibration will be and the louder the snoring will be. This narrowing of the airways could be due to a partial blockage that may be located anywhere in the throat up to the nose. Related reading: What is snoring? Obstructive Sleep Apnea (OSA) is when airflow to the lungs is blocked because the tongue or soft tissues of the throat or soft palate collapse onto the back wall of the upper airway thereby creating the obstruction. This obstruction could be a partial obstruction or it can be completely blocked, which is then known as OSA. OSA is a dangerous condition, and needs to be diagnosed by a sleep doctor or specialist. OSA episodes occur when snoring is loud and then the loud snoring is followed by episodes of silence where breathing stops or almost stops. The brain then triggers a signal to resume breathing, but the person wakes up in the process of ‘catching their breath’. Related reading: What is Sleep Apnea? Our bodies need proper deep sleep at night, to enable it to recuperate/recharge properly. OSA causes a situation where you wake up regularly, and then more than likely don’t get proper sleep. Sleep helps us to function physically but also emotionally in social environments, because of the rest your brain receives in the deep sleep period. Better sleep, better you. Most doctors will tell you that people on average need between 7 and a half and 9 hours sleep a night. Studies have found that sleep deprivation can affect your appetite, can affect the strength of your immune system, and can lead to weight gain, increased diabetes risk, and cardiovascular problems. Apart from the possible risk to our heart health, without proper sleep we can also get irritable, moody, and even develop depression. Without proper sleep we cannot think clearly, react clearly and our work and private lives can suffer. Better sleep, better performance. OSA should not be allowed to play havoc with our sleep lives, as it will then have a license to also play havoc with our health. The Good Morning Snore Solution mouthpiece (GMSS) was developed by top sleep disorder medical professionals, and sold since 2008. When your body and throat relaxes, gravity pulls the muscles toward the opening in your throat, causing a partial blockage or obstruction. The GMSS mouthpiece uses a suction affect to gently pull the tongue forward, which then removes the obstruction in the airway and leaves a clear airway. It is one of only a few mouthpieces on the market today that are considered a Tongue Stabilizing Device (TSD), instead of the more commonly used Mandibular Advancement Devices (MAD). This mouthpiece is unlike any MAD on the market as it does not pull the jaw forward or hold it in place, but instead uses tongue displacement technology to gently pull the tongue forward. Unlike what sometimes happens with MAD devices, this mouthpiece does not hurt the jaw when you use it, because it does not put friction on the jaw. The GMSS therefore works on the premise that if it keeps your tongue forward, it can prevent an obstruction forming in your airway, which then prevents snoring from even starting. The GMSS do not require any special fitting, because it is ‘one size fits all’. It is easy to fit and comes with clear instructions. It is made from soft material and is very comfortable to wear. The GMSS is effective for tongue based snorers, in other words, if your snoring comes from the area directly behind the tongue; the GMSS is for you. If you like what you see so far, and want to check it out for yourself; click the link below. The GMSS does not pose any of the serious side effects that other Mandibular mouthpieces (MAD) might have, such as jaw issues, gum problems, and bite misalignment. As with all snoring mouthpieces, it will take you a little while to get use to the feel of this device, but the good part is it does not actually fit in your mouth, but rather at the front by your teeth and lips. The minor side effects to this device are the following: Your tongue might feel a bit tender for the first few nights and you may experience extra saliva in your mouth. These will however all pass with continued use, so you should not worry about it too much. The GMSS has been tested and cleared for safety by the United States Food and Drug Administration (FDA), and many other international health boards. It also received many positive reviews and recommendations from many doctors, dentists as well as featured industry publications. 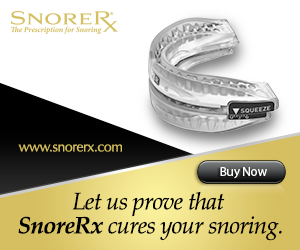 In a study which was done in 2008, the Good Morning Snore Solution mouthpiece was clinically proven to reduce snoring. In May 2008 the results of this cross-over study was published in the Journal of Sleep and Breathing. The results showed that snoring was decreased and daytime sleepiness was reduced in 70% of all the people that participated in the trials, who subsequently decided to continue using the mouthpiece. You can read the full case study here. Long established and reputable brand; since 2008. BPA-free (bisphenol A), which is great as BPA can lead to several serious health conditions. Cleared for safety by the United States Food and Drug Administration (FDA), and some other international health boards. Clinically proven to work, as proven in studies done in 2008. Comfortable to wear and easy to get used to. Easy to fit, and it requires no special fitting. One size fits all, no need to boil and fit yourself. Can be worn with dentures, or other dental work. The GMSS has very minor side effects compared to other MAD devices. Do not require frequent replacement. Possible to use device for a long time, some people report that their device had a lifespan of over 12 months. People suffering from temporomandibular joint disorder (TMJ, TMD) can also use this device. Available for international purchasing, not all devices are available internationally. Comes with a money back guarantee, and you therefore can try it risk-free. Not the mouthpiece for everyone. Breathing through the mouth is difficult while wearing the device. Therefore not advisable to use when your nose is blocked such as with allergies, sinuses, nasal polyps, deviated septum, cold and flu and so on. Nasal strips could be an option. As with all mouthpieces, it can cause excess saliva in the beginning. Unlike other devices, this device puts friction on your tongue, your tongue will therefore be sore in the beginning. Do not use when you have a cold or allergies, in other words, when your nose is blocked. This device makes it very difficult to breath through the mouth, so if your nose is also blocked you might not get any oxygen which is of course very dangerous. Do not use if you have chronic gum problems, such as gingivitis. Do not use together with another oral device, without consulting your dentist first. Be careful as the mouthpiece could become unsafe for use, if you heat, cut or trim it; so don’t. In other words, if you cut it to be smaller, you might swallow it while sleeping and choke on it. Clean the mouthpiece regularly, but only with a denture cleaning tablet/solution and with cold water. You receive a polident denture tablet with your purchase, for convenience. Sleep apnea sufferers should consult their doctor before using this, or any other mouthpiece. Priced at $99.94 for one mouthpiece and $149.94 for the Multi pack. The price might sound high, but the lifespan of this product if looked after, could be way in excess of a year, which means a big saving compared to other devices that you regularly have to replace. If you buy a cheap device and then have to replace it every three months, your end cost could be much higher than the GMSS would be. Plus of course, with the GMSS you get a quality product, which would possibly not be the case with the cheaper device. You can buy the mouthpiece here. Standard 30 days money-back guarantee. In other words, you can basically try it for free for 30 days. This device might look funny and seem small when you see it for the first time, but rest assured dynamite does indeed come in small packets. The GMSS boasts a very high level of customer and review satisfaction, so you can be sure you are getting a product that has stood the test of time. The GMSS may be a little more expensive than other cheaper devices, but I would say it is worth the extra cost. Apart from the obvious quality product that you will get, there is also the matter of less replacing of this device compared with others. I already mentioned earlier that this product has a very long lifespan of over 12 months, so you could end up paying way less for the GMSS than you will if you frequently have to replace the other devices. Give the Good Morning Snore Solution mouthpiece a try, you have nothing to lose. You have a 30 day money back guarantee and will receive a full refund if you are not satisfied with your purchase. Your situation and dynamics are different. A device that I love or that your best friend love, might not be the best solution for you. Look at your situation, the type of snorer you are, and the type of devices available for your needs. After reading this review you can decide if this will be a true fit for you, just as it has been for a multitude of other people. I really hope you will find the solution that is perfect for you. If you suffer from OSA, you should consult your doctor before using any anti-snoring mouthpiece. What do you prefer, a MAD or TSD? Have you tried any other mouthpieces? If you don’t mind, would you please let me know about your experiences. If you do end up buying this product, please come back later and tell us what you think of it. It will certainly help other people to have more information. I hope you found my Good Morning Snore Solution review helpful, and I hope you found all the answers you were looking for here. Stop snoring and start living.